as treats for his first daughter. Lots of scritches and pets to you on this special day. Dear Mittens, what a beautiful tabby girl you are. You are perfectly striped and so soft looking, and your face is beyond adorable. Your pictures are gorgeous, you are perfect a model. I'm sorry that your sister Buttons couldn't stay with you. I hope her new family will be as wonderful as yours. You are a busy kitty. First of all, you love to eat, and then, you love to eat! To stay in shape, you climb trees and chase lizards, and you are a soccer kitty as well. After all this activity, you snuggle with your dad, and you have movie nights with your parents. Happy Birthday, Mittens, you are one fabulous kitty, and I wish you and your family a great day full of celebration, and many more happy and healthy years together. Mittens is an outstanding Cat of the Day! I sure loved all her photos, the baby pics were So adorable! Mittens is certainly the finest cat ever and I hope her day is the best! Dearest Mittens, you are an absolutely stunning beauty! What a gorgeous Tabby lady you are! You're so pretty in all those great photos, and thank you for sharing them with us. So nice to see you as a kitten in some and you with your sister Buttons in that one. I'm sorry she couldn't stay with you, and I hope she got as nice and PURRRFECT a home as you have! I wish I could reach through the screen and around the world and Down Under to Sydney and pet you, and pet Buttons wherever she is, too. I can't, of course, but I know your loving and beloved Purrrents will pet you for me, and I hope Buttons's Purrrents see this and will pet her too ! Today is your birthday, and your sister's too. Or it is probably already tomorrow in Sydney by now, but I'm wishing you both a happy, happy birthday! And what a delightful Purrrsonality you have! You have a lot to do each day, don't you.. checking out and then eating all the different food you need to keep up with, working out playing soccer and climbing trees, helping mummy with her work, giving Paw 5s, roaming in the backyard hunting lizards, watching movies with your dear Purrrents on Friday and Saturday nights.. busy, busy, busy! You and they all love each other very much, don't you.. Daddy always says that you are their first daughter! What a wonderful love-filled home you share! 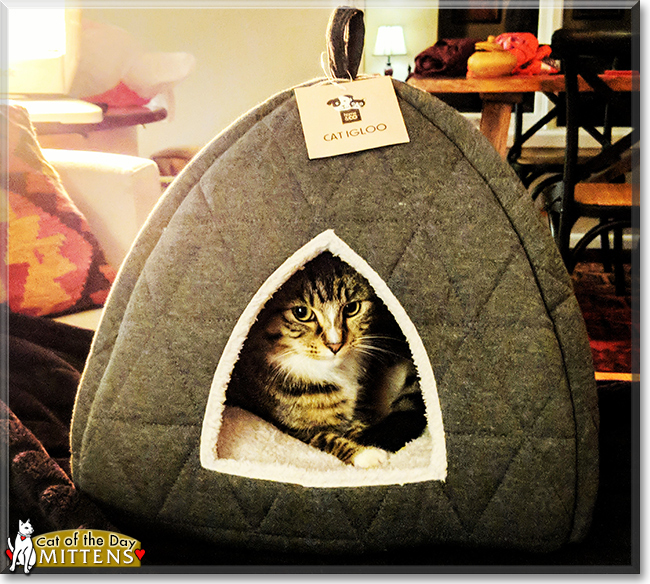 Congratulations, darling Mittens, on being chosen today's Cat of the Day! We hope you and your dear Purrrents and all your family and friends are enjoying a fine celebration, full of fun and lovies and all your favorite games and treats. We wish the same to Buttons and her dear Purrrsons, too! Hello, Mittens in Australia! Happy Birthday and Happy Cat of the Day! What a lovely tabby and white kitty you are! Your fur looks so soft to pet, and I like your white mittens! You are a busy girl- helping mum with her work; playing soccer or spending time in the yard, checking on all that's happening there! (Please be careful on your outdoor wanderings, okay?) You give paw fives, and you do some hunting! You have some favorite foods that your dad prepares for you Then it is time to enjoy your igloo, resting on your special blanket, or a movie with Mittens! Happy, happy Cat of the Day to dear Mittens! Hi Mittens from Oz! Happy Cat of the Day to you, sweetheart, from a fellow soccer lover, hehe, and happy 1st birthday wishes to you as well! Woo hoo!!! What a day for celebration! What a joy it has been, meeting you tonight, Mittens, reading your heartwarming backstory, having the pleasure of paying tribute to one extra special and most deserving girl! Your photo spread has me in total meltdown mode! Oh yes, those signature "mittens!" hehe How perfect your official adoption day, Valentine's Day is, for you truly are a stealer of hearts! And paws crossed that your precious sister Buttons has found her loving furever home, too! Oh yes, Mittens, your mum and daddy sure DO love you, and understandably so! Who could resist a girl as beautiful, as charming, as captivating and you! And just as you say, you love your mum and daddy back every bit as much as they love you! A heavenly match, I'd say! How lucky your family is, Mittens, having a beautiful, energetic, life loving furkid and best furry friend in you! (It's great, being a daddy's girl, hehe !) You're the poster girl for kitty adoption, the "cat's meow," just as beautiful as can be (inside and out! ), and so very deserving of your big day in the spotlight! Thanks for pawing off a note to us, sweetheart, sharing just a smidgen of the happy, carefree, love filled life you're living there Down Under with your adoring mum and daddy! Meeting you today, seeing all of your heart-melting photos, has been a joy! I hope you're enjoying a very special, fun filled Cat of the Day/birthday celebration...roaming your backyard, climbing trees and hunting lizards; clinging and cuddling with your humans on the couch, watching Netflix, hehe; chowing down on yummy vittles; being loved and pampered to pieces, treated to all your heart desires and more! Tons of love, cuddles and kisses to you, precious Mittens, our very special and most deserving Cat of the Day, EVERY day! Now, off to follow you on Instagram! Happy Birthday and Happy Cat of the Day, Marvellous Mittens!